Fly to Birmingham from Dublin and take advantage of great prices and frequent departures with Aer Lingus. As well as being one of the UK's most important business hubs, Birmingham is also a leading shopping destination, with over 1,000 stores to its name. A variety of museums in and around the Birmingham area, such as the chocolate heaven that is Cadbury World, add to the growing appeal of this vibrant city. 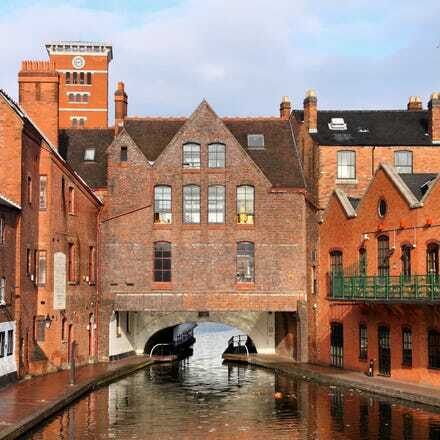 Book flights from Dublin to Birmingham with Aer Lingus today and explore it for yourself. Find a convenient flight time from Dublin to Birmingham and enjoy comfortable air travel for less. Aer Lingus Gold Circle members can relax in the modern surroundings of the Gold Circle Lounge whilst waiting for their flight at Dublin Airport Terminal 2. Upon arrival at Birmingham Airport, hop on the train for the ten-minute journey to the city centre, or take a hire car at a discounted price with our travel partner. Located around eight miles from the city centre, Birmingham International Airport (BHX) is the fifth largest airport in the UK. Once you land, it’s easy to get into the city. The train station is just a short ride away on the free Air-Rail Link bus. The trains themselves depart every 5-20 minutes, with a journey time of 12 minutes (you can grab your tickets at the station). You’ll be dropped off at New Street Station, where you’ll be perfectly placed to start exploring the city. If you need to be at Moor Street (another of Birmingham’s major train stations), you can hop on the 900 bus at bus stop K. This journey will take around 35 minutes. Birmingham is home to a large, efficient public transport system. As well as a great bus network, there are local trains and trams. You’ll find a variety of travel passes to choose from, so there should be one suitable for your length of stay. If you’d prefer to take a taxi, you’ll find taxi ranks at the airport and train stations. It’s easy to hail one on the street (particularly in the city centre), but be aware of busy times such as evenings and weekends.